← *Now* it feels like spring, man. Those of you who live in places that typically have four seasons might remember, perhaps with fondness, how “spring” used to be a proper season. It often came on gently, progressed slowly, and then eased itself into summer’s heat and humidity over a period of, oh, a couple of months. 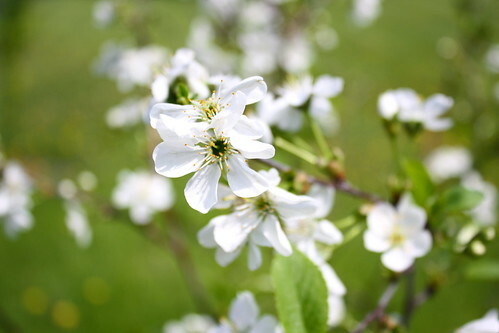 It seems these last few years, summer has been giving spring a miss – or nearly, anyhow. I’m told we may have a more spring-like week next week, but as I was working out in the garden this afternoon, I had this sense of being Completely Behind on the planting because it felt like July, not May. But enough bitching about the weather. I got some stuff done over the last two days, man! 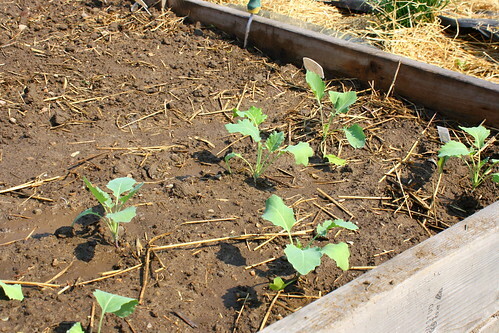 Yesterday, I spent several hours getting a bunch of seedlings into the garden. Most of them I had not labeled when I initially planted them, so I have only the vaguest sense of what they are. 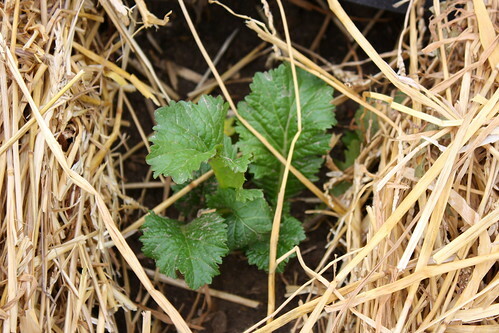 The mustards and red acre cabbage are easily discerned, but the rest? “Brassica family” is all I can say for sure. Also yesterday, I made an executive decision not to rototill this year. It’s not a good way to maintain a garden, and if I just work piece by piece as I go, and mulch the heck out of everything, I should be ok, right? Just focus on the three square feet in front of me, get that taken care of, and move along to the next three-square-foot section. Bit by bit. And we don’t want that. So, bit by bit it is. I am pretending all that crab grass does not exist. It will not exist until I have to deal with it directly, and only then, piece by piece. Being a very goal-oriented person, I continually struggle with “the journey” itself being enjoyable. I want to get there already. It is difficult to simply do what I am doing, be where I am, and go at my own pace. Have I mentioned being The Worst Buddhist Ever? I know from last year’s experience, even were we to till it up, the blades would just chop all the crab grass into tiny bits which would then respawn themselves and be even harder to deal with. You can see them in last year’s photo, just sitting there. Waiting. Laughing at our attempts to subdue them. It’s nearly enough to send a girl screaming for the weed killer. Not quite. But I understand where those folks are coming from. So, I’m saving the lives of countless worms, avoiding the hard-pack below the rototiller blades, and trying it the old-fashioned way. 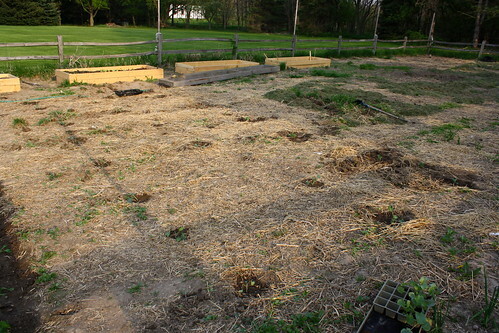 When I finished up yesterday, I could barely tell where I’d planted and where it was safe to walk. I made a concerted effort to space the plants apart this time – last year, they were all crammed together and it made everything much more difficult. There was a ton of space left fallow. 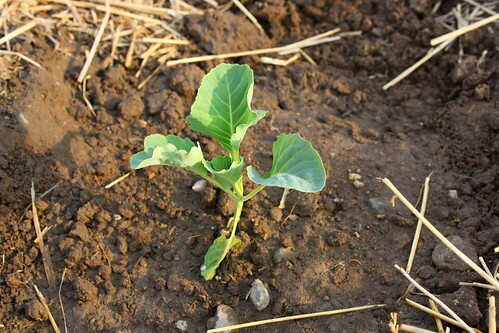 The trouble now is… I’ve used up a third of my space for just the brassica family. And they’re not even all in yet. Hmm. 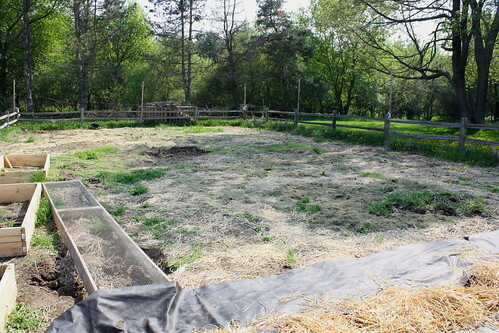 The Engineir, however, really likes the idea of building a bunch of raised beds up closer to the house (it’ll make it easier for him to mow the yard,) so we may end up doing that Real Soon Now and getting some dirt delivered to fill them. I’m fairly sure this is a cabbage of some sort. Today, Mom unexpectedly gave me the day off – woohoo! I spent the morning running errands and the afternoon MULCHING. 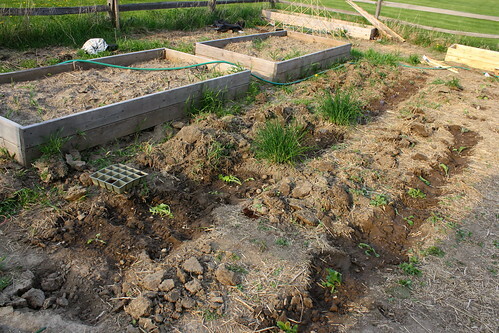 A word of advice to my self of last year around this time: Dear Erin – please mulch soon and weed often. 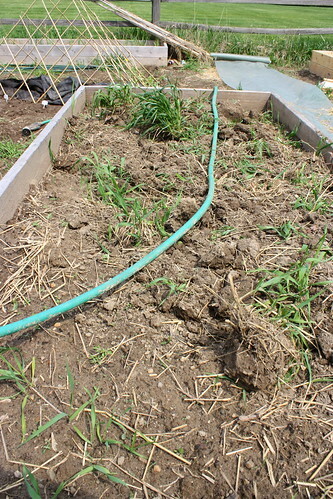 Mulching after the weeds have already established themselves is of no use whatsoever. MULCH, woman, MULCH LIKE THE WIND! The Erin of this year is mulching as she goes, because the Erin of last year, mid-summer, was ready to chuck it all and give up. The weeds were relentless, and I’d done very little to prepare myself for them. I pretty much threw seeds and/or plants into the ground and walked away. Well this year, I know better. The black stuff is like landscaping fabric. It allows air and water through, but no light. 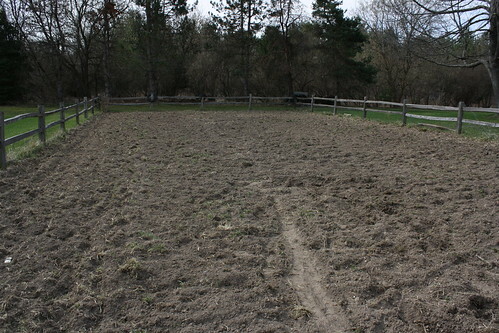 The places where I laid this last year had zero weed growth beneath. There will be a lot more of this stuff. 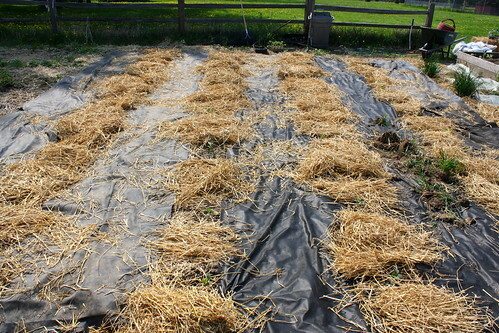 For the proper mulch itself, I like straw. 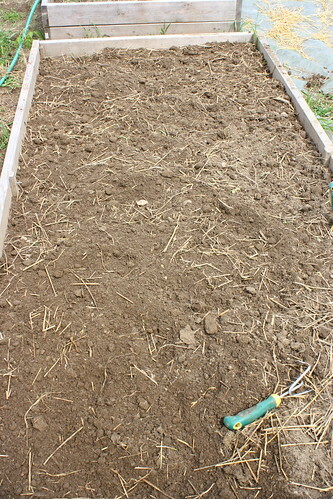 It’s cheap, biodegrades well and can be turned into the soil to improve it. It’s a bit messy to apply, and is a little difficult to work with in tight spaces or with small plants, but if one were to take the time to chop it up, that could be easily remedied. In the interests of being more eco-friendly, I picked up a couple of rolls of recycled weed barrier. The website purported it to be a greener version of the black stuff I like, and it’s made from recycled plastic bottles. 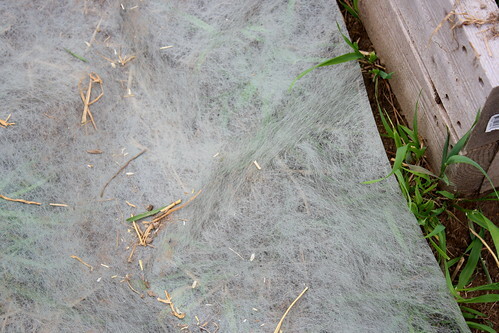 Sadly, this stuff is useless on its own as a weed barrier. It allows far too much light through, and acts as a physical barrier only. You can see the weeds right through it. It will need Stuff on top of it to work properly. Alas. 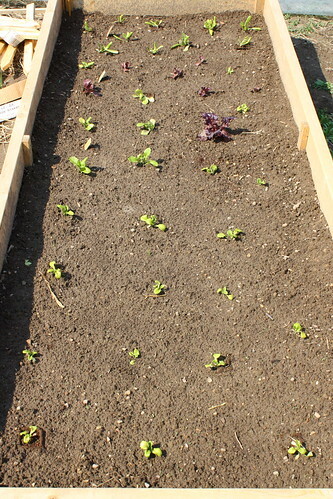 Along with a short row of beetroot, a large swath of spinach, and several rows of carrots. The mulching will have to wait until tomorrow. I have faith they’ll pull through. I’m very thankful I’ll have more time to work on the garden this year. If nothing else, I can say taking care of Mom has that benefit, at least. I reckon I could ramble on more about the garden, but tonight is one of those rare occasions when I venture out of my cave and Be Social.